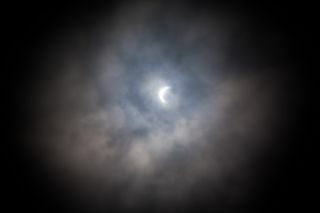 A cloudy partial solar eclipse. Update 8/21: Check out our most recent weather update for the path of totality. With eclipse day fast approaching, many people are obviously concerned about how the weather will impact their viewing. Here's how it's looking for locations all along the eclipse path. Before getting into this, however, I want to make sure anyone reading this acknowledges a "reality check" that this event is still three days away, and forecasters are not overly confident on some of the finer details. Over the weekend, this confidence will increase, especially as Monday comes into the time range of various shorter-term, higher-resolution computer models. The Oregon/Idaho/Wyoming part of the total eclipse path will experience a high-pressure ridge over the Pacific Northwest on Monday, according to the National Weather Service. There will also be a weak low off the Southern California coast that sends some monsoon moisture north from the desert Southwest — but all models keep the moisture south of the Oregon/Nevada border. That should ensure mostly clear skies for much of Oregon come Monday morning. The exception to this would be marine clouds coming onshore along Oregon's central coast. From a climatological point of view, however, marine clouds don't make it very far inland, so locations from the Coast Range eastward appear to have a very good chance of clear skies for the eclipse Monday morning. As for Wyoming, the main weather concern for eclipse day will be a threat for scattered to occasionally broken cloud cover. For now, the consensus is a 30 to 60 percent cloud cover along the path of totality during the eclipse. Most of these clouds will be of the high and mid cloud variety with cumulus cloud buildups, mainly over the mountains, where only isolated shower or thunderstorm activity is expected. Pushing into Nebraska/Kansas/Missouri and southern Illinois, the situation becomes more problematic, as a storm system is expected to move across northern Nebraska Monday morning. So those living near and along the totality path in Nebraska may have to deal with some potential storms and cloudiness early on Monday. The big question that we're focusing on right now is whether the clouds can clear enough later Monday morning after the rain in time for the eclipse. Based on the latest guidance models, it seems that yes, there may be morning clouds and storms, but there's a decent chance that they will begin to scatter or break up by late morning. Obviously, trying to predict a cloud forecast with certainty for a 2-minute window that's still a few days away is a significant challenge. Looking at Kansas and Missouri, this same unsettled weather system will be a factor. That, combined with a strong southerly wind, brings increasing low-level moisture for Sunday night into Monday. The GFS (Global Forecast System) and Canadian models are more bullish on rain and cloud-cover chances; this may be an issue for eclipse watchers. Looking farther east at Kentucky and Tennessee, high pressure at the surface and aloft is expected to remain in place across the region. Kentucky looks to remain on the northern periphery of the ridge, and some of the model data suggest that isolated afternoon or evening storms could occur. Skies look to remain mainly clear in the morning, with cumulus clouds popping up during the afternoon. In general terms, it looks like very typical weather for late August in the Ohio Valley. However, the development of these clouds is dependent on warming from the afternoon sun, and of course, solar heating will be reduced during Monday afternoon. Cumulus clouds may begin to form and then dissipate as the air cools in response to the eclipse. The same holds true for Tennessee, with 30 to 40 percent cloud cover currently anticipated, with only a slight probability (20 percent or less) for most of this region. Our final stop is northeast Georgia and the Carolinas. Unfortunately, a stalled weather front is running from northern sections of Georgia and South Carolina east through the south end of North Carolina. And that front quite possibly could generate scattered afternoon showers and thunderstorms, which may wreak havoc for those wanting to witness the eclipse. In this type of summer/sultry pattern, it is always difficult to discern, especially a few days out, specifically the different cloud and precipitation coverage. On a positive note, there are signs that an offshore ridge of high pressure will try to build in, possibly suppressing somewhat any cloud or shower development. The eclipse could also aid in keeping the threat of daytime clouds and shower development down by helping to lower temperatures in similar fashion to what we noted for Kentucky and Tennessee. Still, based on the projected setup, it is prudent to mention at least a 30 to 35 percent chance of showers and thunderstorms. Based on long-term climatological records, the best chance of encountering building afternoon clouds and showers will be over the high-terrain areas (Blue Ridge, Appalachian and Great Smoky mountains), while the best chance of getting some views of the sun will be along the coastal plain. Joe Rao serves as an instructor and guest lecturer at New York's Hayden Planetarium. He writes about astronomy for Natural History magazine, the Farmer's Almanac and other publications, and he is also an on-camera meteorologist for Fios1 News based in Rye Brook, New York. Follow us @Spacedotcom, Facebook and Google+. Original article on Space.com.